The music during the cold opening was expertly chosen to give off an atmosphere of mistrust. AMC really know how to build tension in the intro and then get the adrenaline flowing through the viewer’s veins when the iconic theme music hits. It felt really good to see locations in the comics depicted on-screen at last. The tower Rick sees when he looks out the window in the interview scene is faithfully recreated from the comics. It’s interesting to see the use of technology that is functional. Apart from guns we haven’t seen much of that at all. What I also found interesting was the contrast between the group and the people at the Alexandria safe zone. The writers didn’t have the group wash right away because they wanted to illustrate the difference between the group and the Alexandrians. Yes, I said Alexandrians, I’ve coined that term and I’m keeping it. In fact I want you all to use that phrase now. It was good that the writers gave us some slower scenes where we get to just watch and listen to these characters interact. There was a lot in that interview scene, a wealth of fascinating character development. 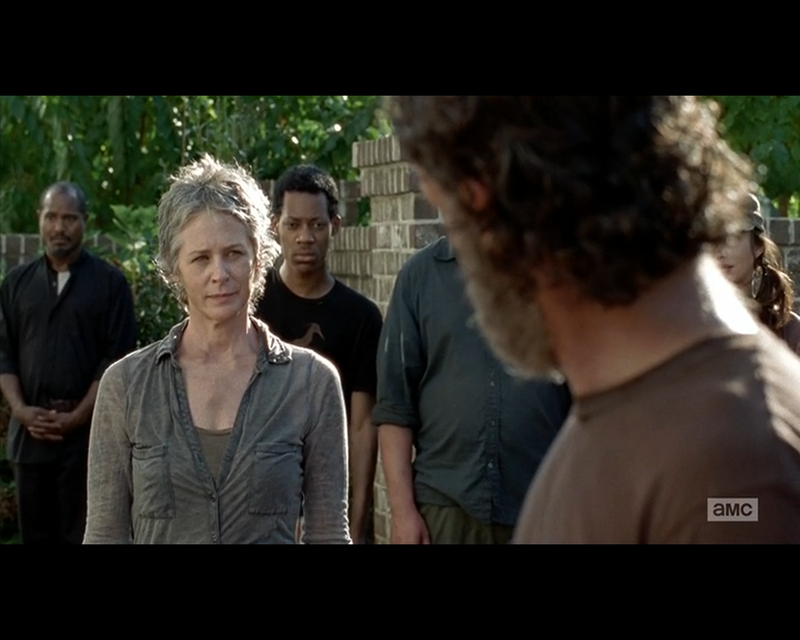 Melissa McBride’s acting in the scene where the group turn over their guns was very telling. Before the group entered the Alexandria Safe Zone Carol expressed a suspicion of the people also, telling Rick that he was right to not want to join them. Therefore I would say her behaviour when she was handing over the gun was deliberate to make the people of Alexandria believe she is harmless. As she fumbled with the gun and generally acted in a meek way. Giving Rick a meaningful look when she knew the Alexandrians weren’t looking. We of course get another clue that she is trying to hide her true personality when in the interview she tells the leader that she misses her husband and loved him. We know that she hated her husband because of his abusive nature. This new twist in the tale has added a fresh element to the show. I foresee some really fresh content hitting us in the next few weeks. The way the different members of the group are reacting to life inside the walls is very cool to watch, Daryl is struggling to integrate the most. His interview scene just shows how far removed from normal life he is now. It’s exciting whenever a couple of new characters emerge, so this big injection of people into the story feels like a new era for the show. Alexandria and the area around it has a really cool style, it should be good to get to explore that territory more in the episodes to come. Every so often in The Walking Dead the permanent base is changed, giving us a fresh visual to connect the idea of home to. They try to keep the visual side of the show fresh, for some time exploring what it might be like to try to survive the apocalypse in a prison, or a camp site and now a gated community. The idea of a burgeoning society attempting to start again in the wake of the destruction of the last one is a fascinating idea that isn’t often explored. The characters are all being given jobs in this new community. The writers are really brave to hint at the main character possibly becoming bad. It seems the writers might be turning the tables on the Rick and Diane characters. In the comics Diane was a man, that character was the leader that showed signs of possibly being evil. Although he actually isn’t as bad as suspected it is hinted that he may be a bad guy, ultimately he cannot cut it as the leader of the group as he was just weak. 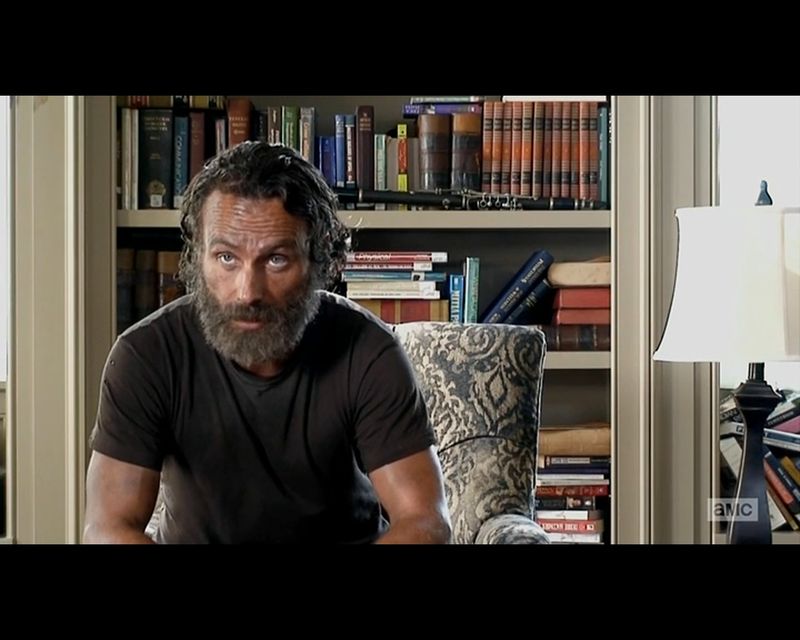 However it seems Rick is the one that is overall a good guy but showing scenes of becoming bad. I am of course talking about the scene at the end of the episode where he tells Daryl and Carol that they may take over Alexandria should they need to.